Dr. Romanoff is a lifelong resident of Toledo, Ohio except for twelve years he spent receiving his formal education. He received his medical degree from Ohio State University and completed his internship in internal medicine at Mount Sinai Hospital in Cleveland, Ohio. Dr. Romanoff trained and was chief resident in Ophthalmology at the University of Wisconsin, one of America's elite ophthalmology residencies. Since setting up his practice in 1978, Dr. Romanoff has helped literally thousands of patients in NW Ohio, the country and the world achieve better quality of vision with up-to-date treatments and solutions. Dr. Romanoff is a Clinical Assistant Professor of Ophthalmology at the University of Toledo College of Medicine. He is also instructor of Ophthalmology in the Family Practice residencies at Flower and Toledo Hospitals. Dr. Romanoff is on the staff of Flower, Toledo, St. Vincent and St Luke Hospitals and the University of Toledo College of Medicine. He is currently serving as Chief of Ophthalmology at Flower Hospital in Sylvania, Ohio. 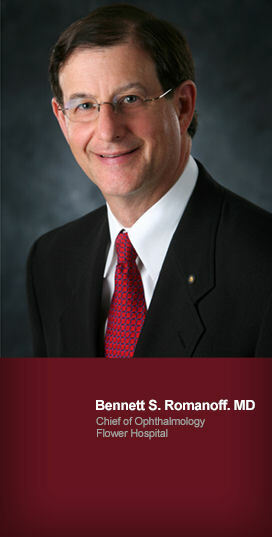 Dr. Romanoff has lectured both locally and internationally in the field of Ophthalmology. He has also been featured and has written articles on various subjects in professional journals. Dr. Romanoff continues his rigorous, ongoing training to ensure that he is doing everything possible to improve his patients' vision and quality of life. Dr. Romanoff has served on many community boards and has been an active member of the Sylvania Rotary chapter for over 33 years.